Sometimes you just need an easy meal right? The kids wanted peanut butter sandwiched and grapes for dinner but I wanted more. I gave into them and that’s what they had. I try not to eat a big meal with them because hubby does not get home till 10:30 and I like to eat with him. 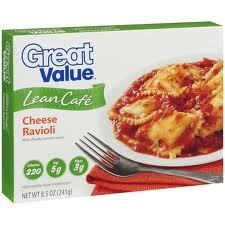 I look in the freezer and pull out Great Value (Wal-Mart Brand) Lean Cafe Cheese Ravi0li. I should not of done this! The picture on the box looks appetizing enough and it only has 220 calories. I wish i had thought to take a picture of it. Not good! I know I am on a diet but I need sauce with my pasta. If I had been thinking strait I would got out some of the left over Lazy Crock Pot Spaghetti and Meat Sauce to put on it. Again, I am aware I am on a diet but I would like more than FOUR ravioli! I also prefer to have taste. Over all it was very bland and yuck. I ate it because I spent my money on it and I spent my time cooking it. It did have some good credits. I paid less than $2 for it and it had microwave directions. Before you ask, I used the hour-long oven directions because I don’t own a microwave. So if you want cheap, fast, and bland cardboard go for it. Otherwise spend little more and get a name brand meal or better yet just cook or eat left overs. I know what I will do next time. **This post was in no way sponsored by Wal-Mart or Great Value Brand.